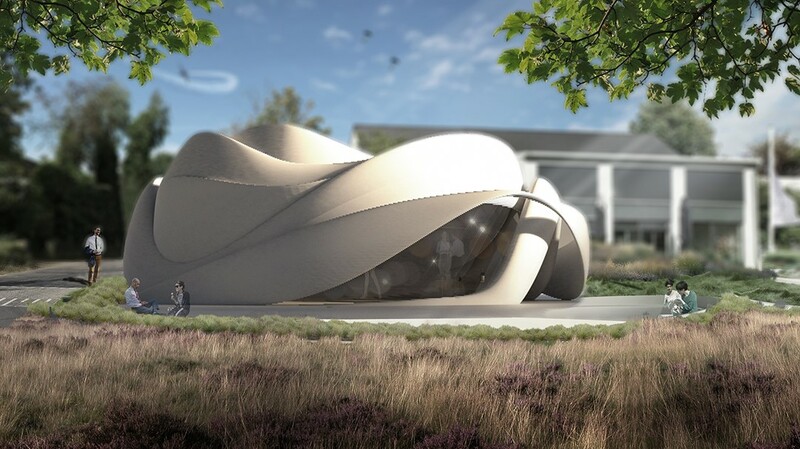 TEUGE – With the completion of the Preliminary Design and new artist impressions, the realisation of Europe’s first 3D printed building, De Vergaderfabriek in Teuge (G), has moved into an important phase. ‘In recent months, we succeeded in converting the draft design into a printable structure. The printed concrete is constructional, but at the same time, aesthetically pleasing. 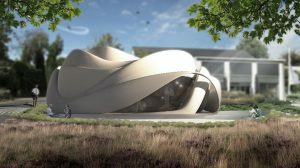 This is a crucial step for the testing phase and forms the basis for the development of the Final Design and the ultimate building permit application which will be submitted in August’, says Revelating’s Project Leader, Hugo Jager. Jager goes on to call it an excellent result of co-creation and multidisciplinary consultation within the consortium. ‘We, and by that, I certainly also refer to the initiators Marjo and Arvid Prigge from De Slaapfabriek in Teuge, are ecstatic with the result and proud of what we have achieved together to date.’ The consortium working on the project consists of the top players in the Dutch 3D printing and construction industry, namely: The Form Foundation, Witteveen+Bos, CyBe, Van Wijnen, Engie, Revelating, Elma Media, Lexence Advocaten, De Slaapfabriek and Centre4Moods are supported in this respect by the Eindhoven University of Technology (TU/e) and Clean Tech Regio. De Vergaderfabriek is an initiative of De Slaapfabriek from Teuge (SME) and Centre4moods (startup). Printing in 3D means we emit 40 percent less CO₂ and generate 75 percent less waste. Due to this, in part, the building will soon sport a zero-footprint. Moreover, in so doing De Slaapfabriek introduces a new way for meetings and training sessions to take place, an experience concept with wall-to-wall videos, sound, scent and sensors in an iconic and sustainable building. In this case, a building and experience that matter.